Company representatives show their support at the site of the project. 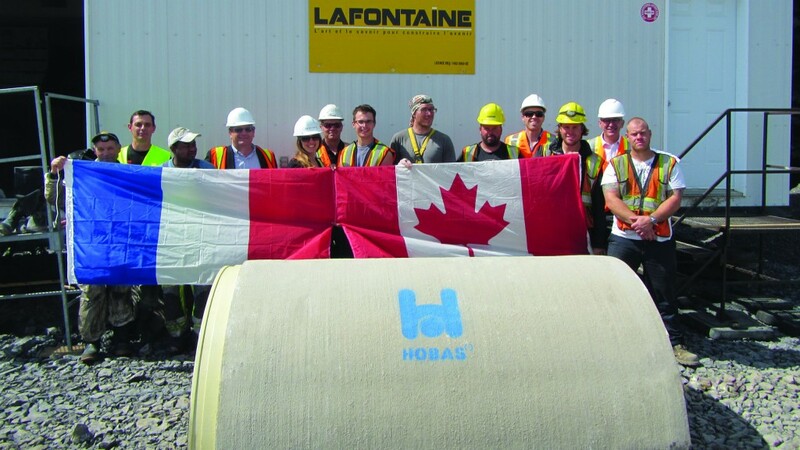 The solution was HOBAS, the only pipe supplier in Quebec able to provide a custom-tailored product. HOBAS was awarded the contract and supplied 720 feet of NC Line profiles with a cross-section of 61 by 31 inches. The non-circular cross sections were manufactured in Germany and shipped to Quebec City. With minimal excavations and no traffic disruptions, contractor Lafontaine / 2C2T sliplined the old corrugated metal within five weeks. Due to the project success, the Québec Road Builders and Heavy Construction Association subsequently awarded the rehabilitation job best environmental project of the year. The HOBAS NC-Line consists of glass-reinforced polyester pipes designed for constructing or rehabilitating non-circular sewers. These special pipes can be made in virtually any shape to fit inside the old sewer for rehabilitation. Consisting of polyester resin, quartz sand and glass, the pipes are designed per WRc’s Sewer Rehab Manual and manufactured on the basis of DIN EN 14364. Different pipe shapes and wall thicknesses can be supplied and are selected on the basis of the design requirements. Design and manufacture of the HOBAS NC-Line thus meets a wide range of customer specifications. All HOBAS products have inherent corrosion resistance and superior hydraulics that maintain maximum flow capacity.